Kiunga, Kenya is a small fishing community of about 3500 people located just a few miles south of the Somalian border. The village is situated along the coast of the stunning Indian Ocean and the area is home to an important marine conservation reserve. It’s also an area that has suffered extreme drought for many years. The location of Kiunga close to the shore with abundant seawater made it an ideal location for the first GivePower Solar Water Farm. Why water? The water crisis continues to grow exponentially across the world. There are currently 844 million people around the world that lack access to clean drinking water – more than twice the amount of people living in the United States. Among them are 300,000 children that die every year due to water-born diseases. These facts and numbers are deeply alarming, and GivePower is on a mission to bring clean drinking water to millions of people around the world, beginning with the community of Kiunga. After the monsoon time, Kiunga is dry and parched and community members have to travel an hour to collect the only source of water which is available which is dirty and brackish water. It is often the same water in which animals drink and bathe, and it contains contaminants and parasites that can cause terrible sickness and sometimes death. 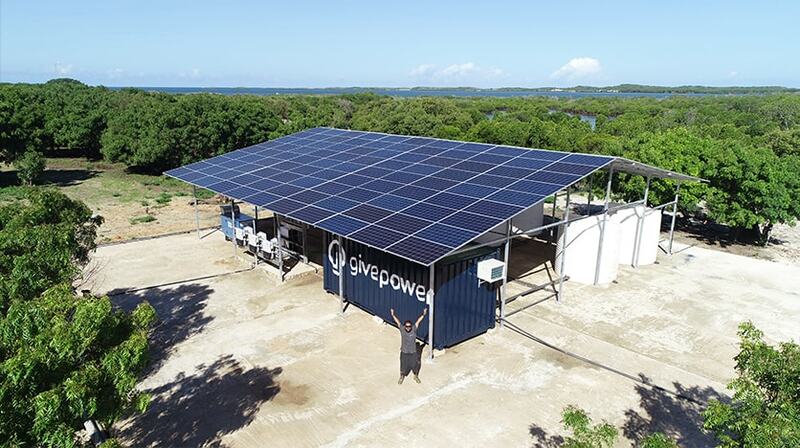 GivePower’s Solar Water Farm is a breakthrough blueprint solution for coastal areas struggling with water scarcity. With advanced filtration systems and new solar-powered desalination technology, GivePower is converting sea and brackish salt water into clean and healthy water. Each solar water farm produces enough fresh drinking water for 35,000 people every single day. Compared to most ground well systems, the GivePower solar water farm produces a higher quality of water over a longer period of time with no negative environmental impact. Learn more in the video below which tells the story of our first Solar Water Farm, located in Kiunga, Kenya.